Grilled Avocado with roasted tomatoes makes a great side dish or a quick, light meal. This easy to make recipe is plant-based and Paleo diet friendly. If you aren’t into grilling, simply roast the avocados along with the tomatoes. DIRECTIONS—prepare the grill for a medium-hot fire. Set the oven to roast setting at 550ºF or as high as it will go. Line a baking sheet with parchment paper. Add tomatoes to a bowl along with the garlic cloves and corn. If using fresh corn, slice it from the cob and add to a bowl. If on a Paleo diet, omit corn and increase tomatoes. Chop onion and add to bowl. Remove stems, membranes, and seeds from 2 of the peppers. Chop and add to the bowl. For more heat, leave the seeds and membranes in the peppers. Add 1 tablespoon of olive oil to the bowl, salt and pepper, then mix well to coat all the vegetables. Turn vegetables onto parchment paper. Place in oven and roast until lightly browned, turning once or twice during cooking. In the meantime, slice the avocados in half lengthwise. Coat each half of the flesh side of the avocado, with a little olive oil. Place the avocados, flesh side down on the grill and grill until warmed through and slightly charred. 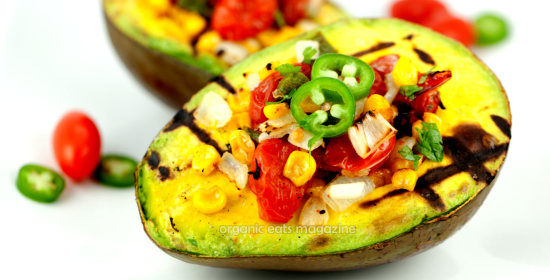 If you don’t want to start the grill, roast the avocados in the oven with the other vegetables. 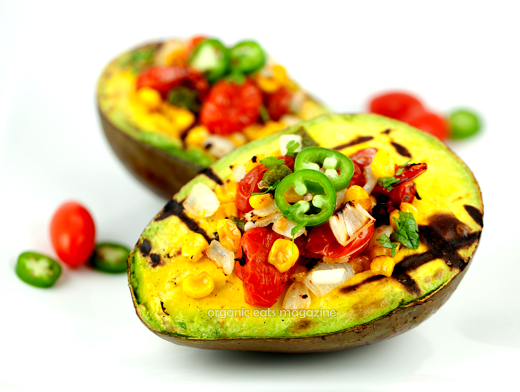 Turn grilled avocados over and fill the center with the roasted vegetable mixture. Top with chopped cilantro and sliced peppers. Squeeze with fresh lime juice and serve with extra wedges of lime juice on the side.